With little in the way of fundamental news on the economic calendar for either the US dollar and Japanese Yen currency traders are looking to the bigger geopolitical picture for a degree of direction. Looking back on last week’s price action for the dollar yen Friday provided a bullish engulfing signal which was partially confirmed on Monday, but it must remembered that this was all against a backdrop of thin markets owing to a national holiday both in the UK and the US, so we need to temper our analysis with a degree of caution. 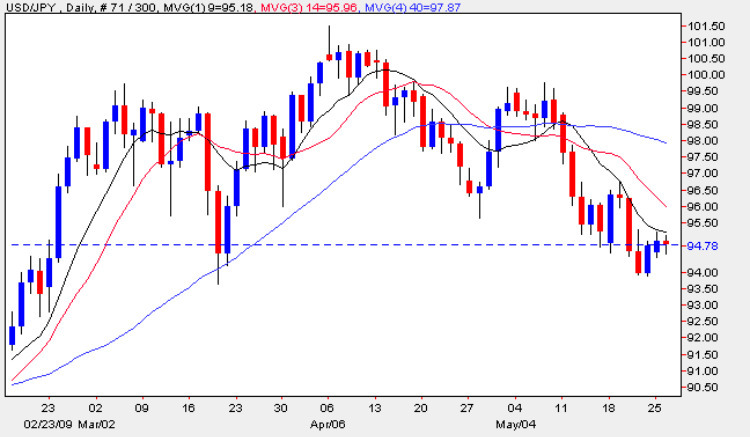 The high of Monday’s failed to close above the 9 day moving average and indeed bounced off suggesting that the bearish tone is likely to remain in place and with the dollar yen price now well below the neckline of the head and shoulders pattern, any short term reversal would require considerable momentum to penetrate this region and which seems unlikely at this stage. My trading suggestion for today is to use the current short term reversal as on opportunity to sell into the market opening fresh position trades as we wait for the pair to move lower in due course.